I wasn't going to address this until the regular stockholder update later this week, but there's been so much buzz I feel I must speak about it now. Many of you have noticed the unusual donation on the side panel of MinerBumping. Is it some kind of stunt? Is it a typo? The rebels have been very nervous lately. 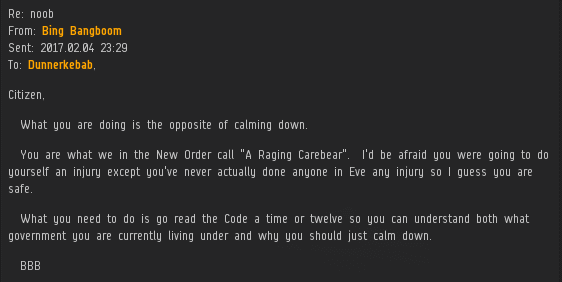 Like all carebears, Anti-Gankers focus on money almost to the exclusion of everything else in EVE. They see the amount of isk in our Treasury as a barometer of the health of the New Order--as if the money's meant to be hoarded instead of spent for the Code. 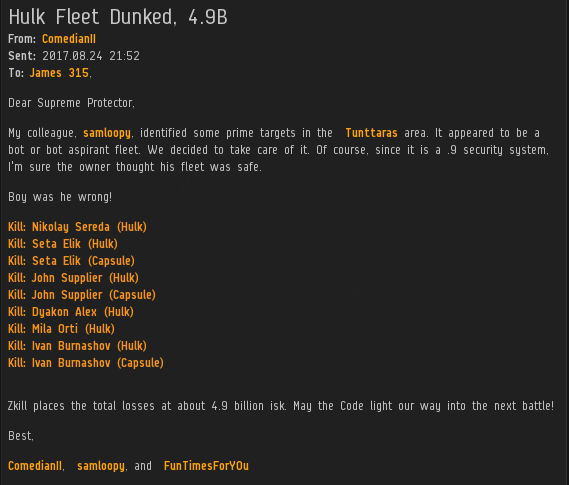 On occasion, rebels will send unsolicited messages to people who donate a large amount of isk to the New Order, as Rusell did earlier this year when Hrothgar Nilsson purchased 32 billion isk worth of shares. It really bothers them. So you see, I need to talk about this. Leaving the rebels in suspense any longer could be considered a form of torture. Long story short, it's true. 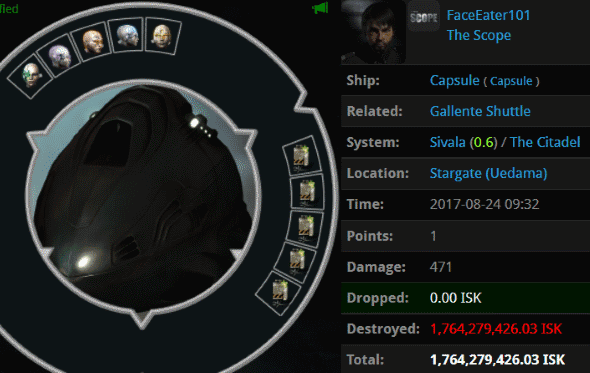 Agent Ben Li aka Zula Terra aka Beliar Gray really did purchase 315 billion isk worth of New Order shares. 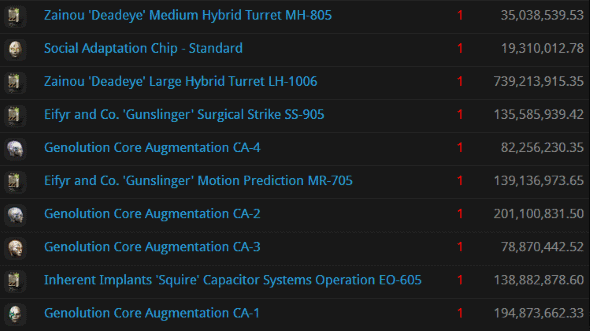 Ben Li had a large number of alts with quite a few skillpoints, and much of the isk came from selling those characters. 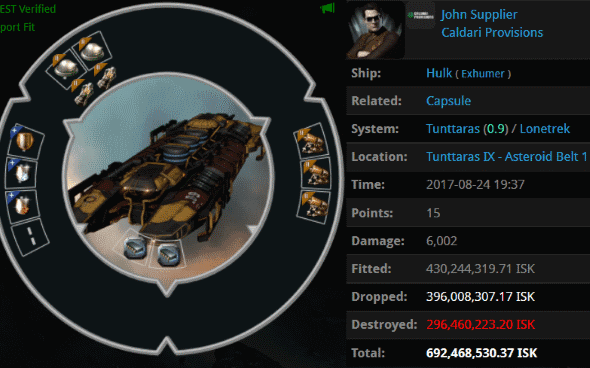 Look at all those zeroes, each one a dagger in the heart of the carebears. 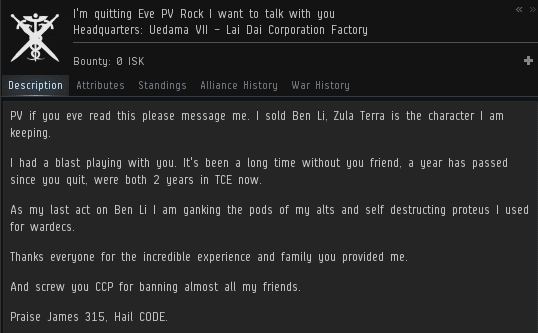 There's more to the story: The isk was officially purchased in the name of I'm quitting Eve PV Rock I want to talk with you, a corporation created as a beacon to send a message to a long-lost former EVE player, PV Rock. 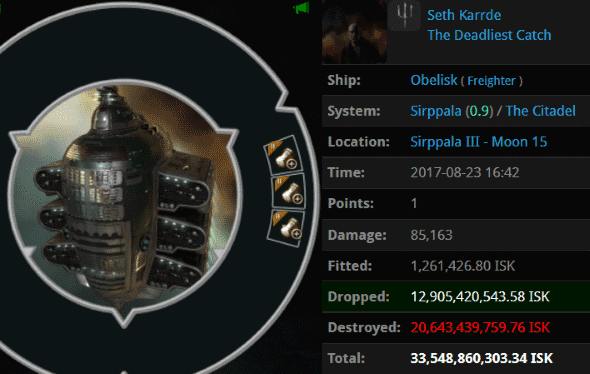 A 315 billion isk beacon. Now that's friendship! 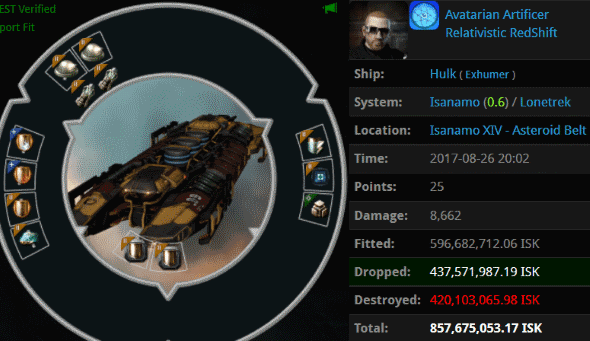 As you may recall, when PV Rock quit EVE, he, too, purchased a large number of shares--142 billion isk worth. 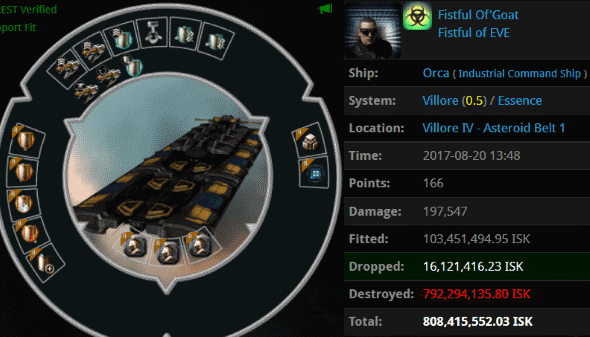 Needless to say, I'm quitting Eve PV Rock I want to talk with you's purchase is historic. Later, we'll run the numbers on all the hat-tipping that will need to be done as a result of this. In the meantime, I merely wanted to put all of the New Order's enemies at ease. You have nothing to fear. If you obey the Code, of course. 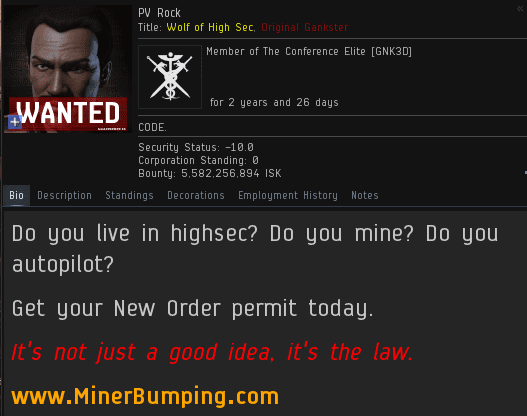 As the scope and influence of the New Order continues to grow, an increasing number of EVE players have become Agents, sworn to uphold the Code. They operate both inside and outside of the mighty CODE. alliance. 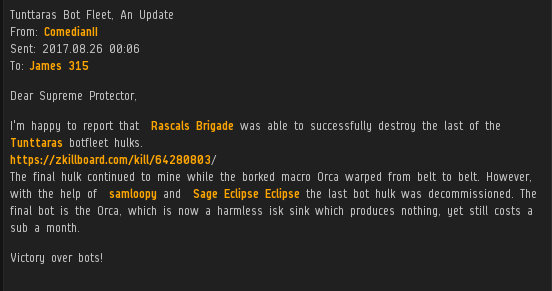 The bot-aspirants of highsec have long recognized the deadly threat posed to them by members of CODE. Sometimes they forget to consider the countless non-CODE. Agents, whose weapons of war are no less lethal. 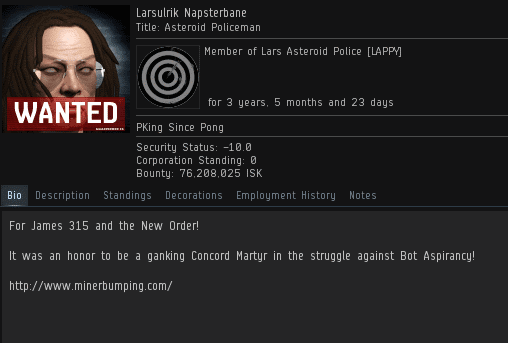 Agent Larsulrik Napsterbane earned his elite PvP stripes by killing mining vessels such as weaponman110's untanked Retriever. A standard termination notice was delivered to the misguided miner. The miner's response was decidedly nonstandard. 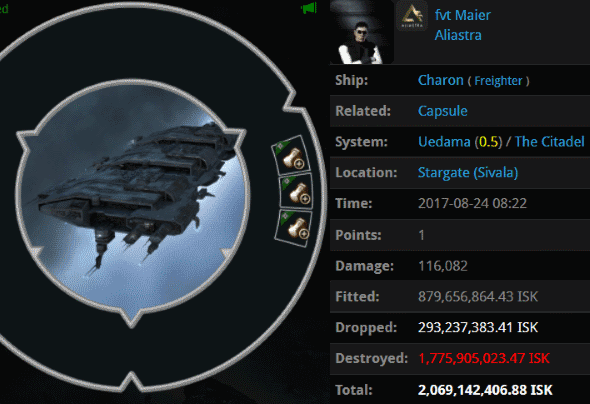 And he completely failed to pay his 10 million isk permit fee. 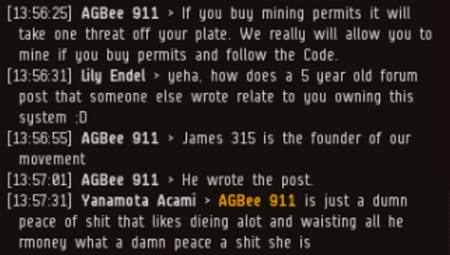 When weaponman110 was instructed to cease his resistance to the Code, the silly miner continued to dig his own grave. Yet Larsulrik saw the good in weaponman110. All he needed was an understanding Agent willing to help him unlock his potential. In Larsulrik Napsterbane, he found exactly that. Unfortunately, weaponman110 had difficulty believing his great luck. The miner lacked faith in the system. Apparently someone told him that mining permits aren't a good deal--even though he'd already seen what happens to unlicensed Retrievers! By this point, weaponman110 felt he'd alienated Agent Larsulrik to such a degree that there was no turning back. He suffered a nervous breakdown, most likely thinking about his lost opportunity to become compliant. No longer capable of drafting a complete tearmail, weaponman110 resorted to sending Larsulrik random links. The miner remains in a state of darkness. 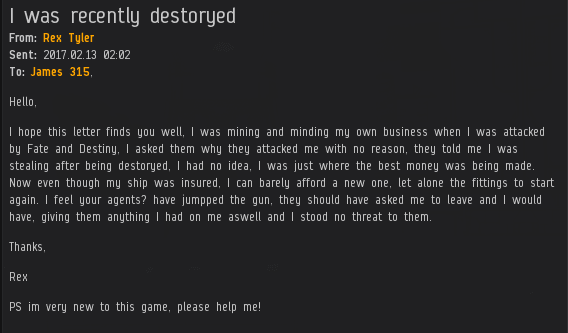 Never fear, dear reader: Our Agents are always ready to rescue a miner, whenever an opportunity presents itself.